Matt Gyuraki and Rob Tutton of LCCN. The hottest item on St. John these days is not a fancy car, a fast boat, or even a house with a roof. The main object of desire is a NanoBeam, a device that was not part of anyone’s vocabulary before Hurricane Irma struck last September. A NanoBeam is a small, round object that essentially functions like a radio and allows a person to send and receive internet and cell phone calls. The device gets its signal from one of several antennas set up by the Love City Community Network. Love City Community Network is a collective of technology experts and volunteers who began working together after Hurricane Irma. At first their mission was to provide connectivity support to disaster relief agencies and to establish WiFi hotspots for the public. Over the past several months, LCCN has transitioned into a non-profit corporation with the intention of becoming a full-service internet provider. For now, they manage to provide residents and businesses with basic cell phone service and an internet signal that varies in speed and reliability. 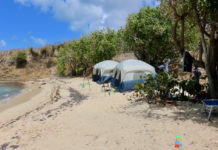 Despite the fluctuations of speed, most of their clients agree that what they offer certainly beats a trip into Cruz Bay to find a free public WiFi hotspot. 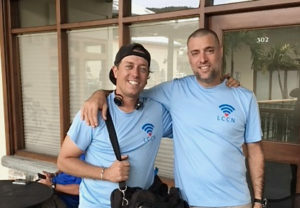 Residents of Fish Bay and Coral Bay, areas where customers were not able to get cell phone service before the storms, are particularly pleased that LCCN’s signal reaches into their homes. In order to take advantage of LCCN, residents have to be within a direct line of sight to one of their points of distribution. 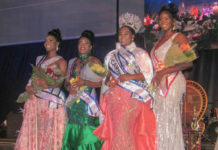 These points include the top of Great Cruz Bay, Ditleff Point, Bordeaux Mountain, and Lovango Cay. 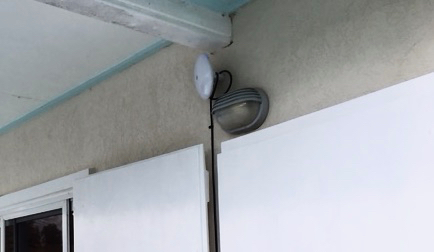 The NanoBeam, the white bulb-like object above the gray porch light, points at a LCCN distribution point. Residents and businesses must also purchase online their own CPE – client provided equipment – more specifically, a Ubiquiti NanoBeam ac Gen2 (NBE-5AC-GEN2.) The units run in the neighborhood of $80 to about $120, depending on the online vendor. Potential customers need to fill out a form and include their GPS coordinates so LCCN can determine if they’re in their range of service. 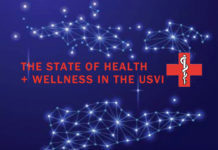 Further details are available on the group’s website: https://lccn.vi/get-connected/. LCCN isn’t charging a set fee yet for their services, but they’re asking for donations to help their organization purchase equipment and hire additional staff who can program and install the NanoBeams. As word gets out, more and more people are ordering their NanoBeams and dropping them off at the Computer Express office Connections in Cruz Bay. “We get between five and 20 a day,” Tutton said.